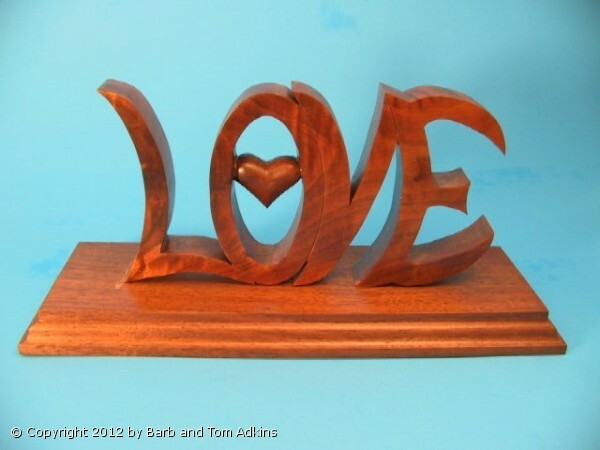 Love Sculpture with a hand sculpted fully 3 dimensoinal heart. We have designed the Custom Font for the letters so each letter molds to the letters on each side. Made from Walnut on a Walnut base. Each piece is custom made. No 2 are alike. We have also made a heart with a 50 cut into the piece, above the heart for 50th Anniversaries. When making this piece,each cut out section of each letter is individually cut out. The saw blade must be taken out of the whole and reinserted into the next area for each cut. Each letter must be sanded. The Heart is also part of the same 1 piece of wood. This is great for weddings, anniversaries, Valentines Day, Birthdays. We also make mini pins or necklaces of this piece. See below. -There a choice of woods, such as oak, Walnut, pine, Purple Heart, etc. - Any year, such as wedding, or Anniversary number (20, 25, 50) can be added above the heart. -The Heart may or maynot be painted red.